In our latest walk through Hong Kong’s “little Java” – the community of Indonesian domestic workers who gather on Sunday in Causeway Bay – we were joined by a student group from the School of Contemporary Chinese Studies, University of Nottingham, led by Dr. Andreas Fulda, as well as Indonesian domestic workers who are also writers and participants in the Afterwork Reading Club and other literary groups. 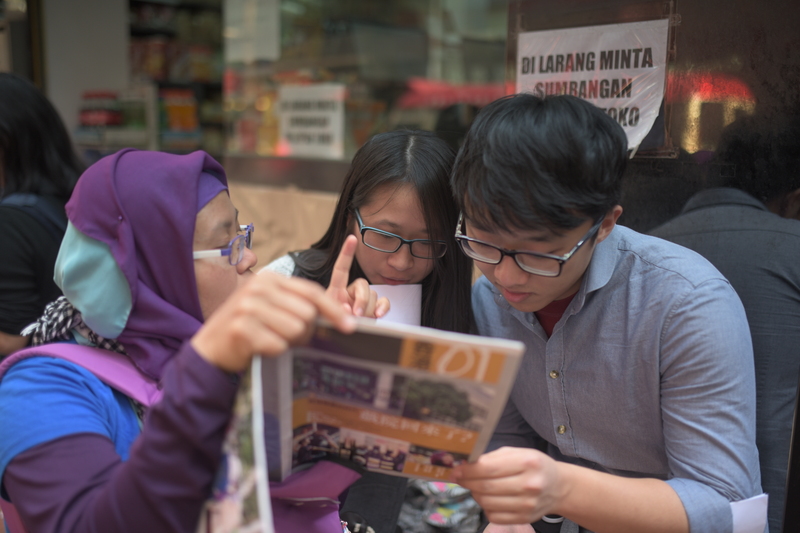 As usual, we gave some general information about the Indonesian domestic workers in Hong Kong, as well as the particular policies of both Indonesian and Hong Kong governments that impact them. 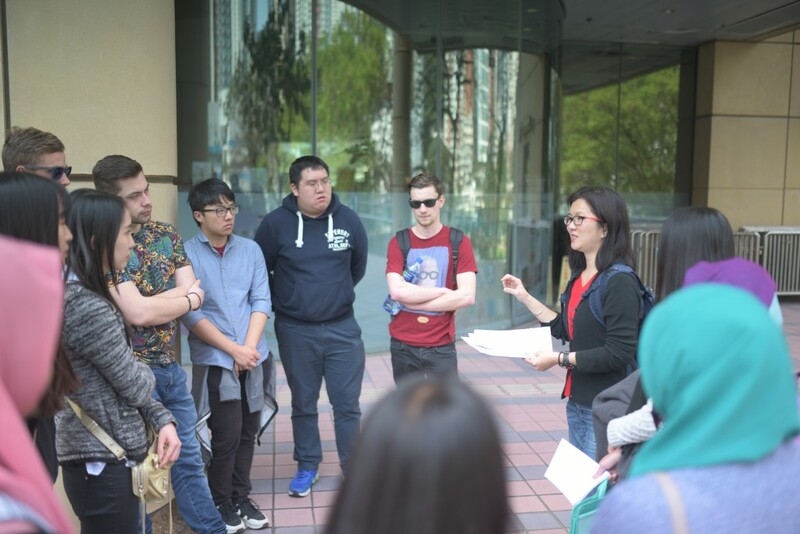 We started out with a briefing next to the Central Public Library – where we immediately felt the restrictiveness of using public space in Hong Kong, even for Hong Kong people! The library security guards said that we were on library grounds, and even though it was public space, we could only record video or audio after applying and getting permission. Luckily after we said we would not record anything, he allowed us to stay there for 15 minutes. 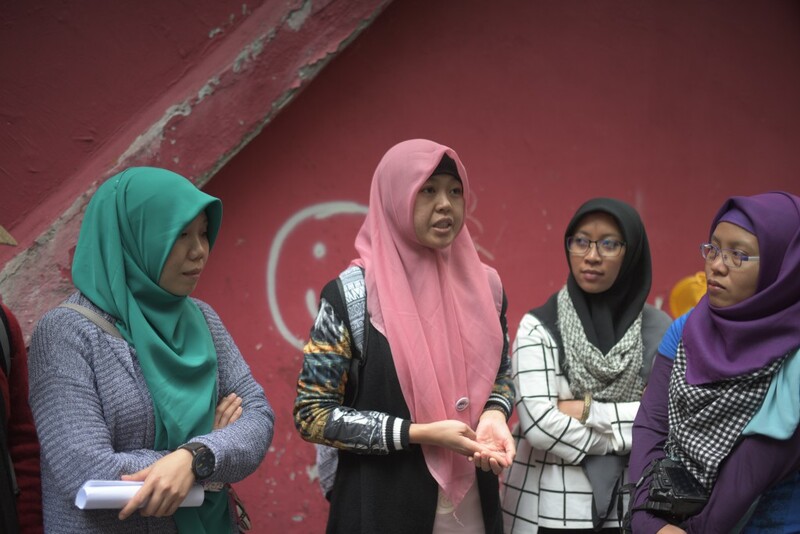 At our next stop in front of the Indonesian Consulate, domestic workers also shared their own personal experiences, good and bad, with their past and present employers. For example, one of the domestic workers, Nani, is currently taking courses at Open University, and her studies is encouraged by her employer, who has even purchased a laptop for her. Another, Susan, said that her elderly employer was very understanding of her wish for private time and space, and was also supportive of her writing activities. While the supportive attitudes of some employers is not widely known and talked about in the media, another topic less discussed in media is the conditions of domestic workers’ training before arriving in Hong Kong. Another domestic worker, Tara, said that in her training centre there were about 100 women sleeping in a big camp, and they were trained to eat within five minutes, taking only small portions of food, and not allowed to speak with family or use their phones for most of the time – almost as if they were in a jail. The periods that workers needed to stay there before their placement in jobs overseas varied from three months to a year. 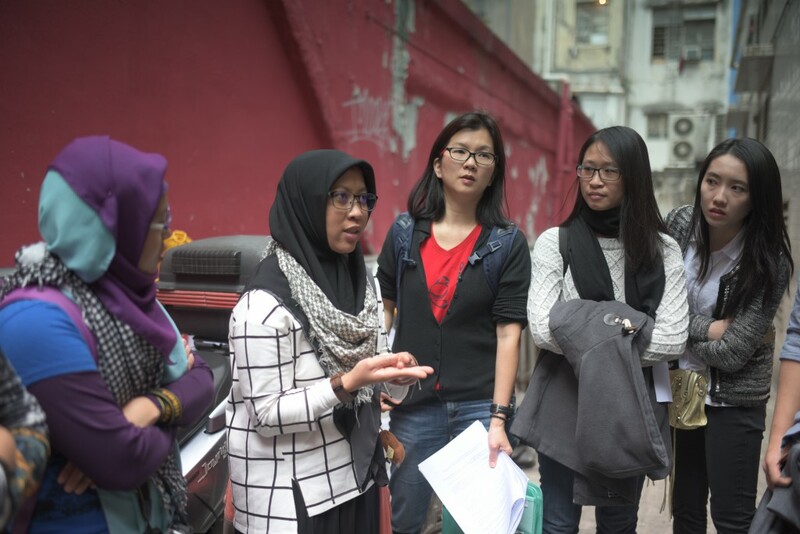 All the domestic workers said that it was only in Hong Kong that they had begun to write stories. They think their interest in and passion for writing is an important and positive change in their lives, something which they would probably continue after they returned to Indonesia. 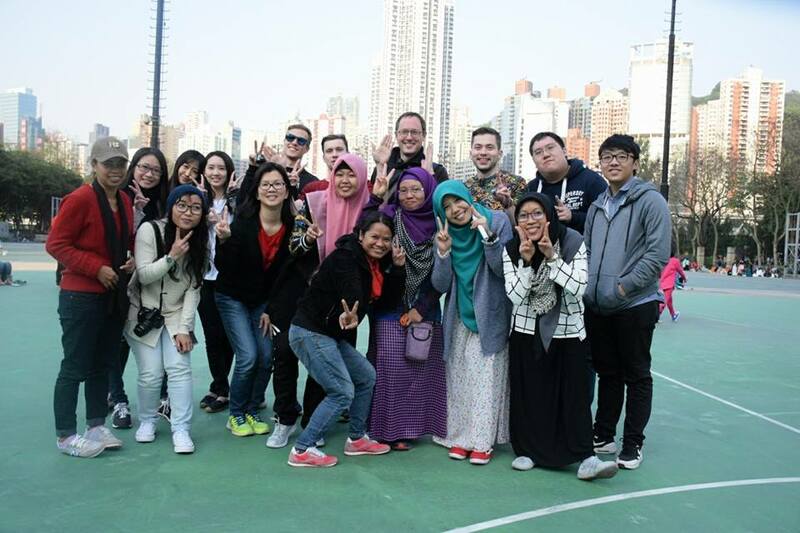 Recently, these domestic worker-writers have participated in activities such as the project called Afterwork / 工餘, by artistic venue Para-Site, and also been reported about in the new weekly newspaper/journal HK01. Besides stopping at the Consulate, we also made our usual visit to the $5 lift – in the Causeway Bay Shopping Arcade on Sugar Street. This time, we were happy to find out that the discriminatory practice of charging $5 to visitors (nearly all Indonesian) only on Sundays has been totally removed; now, anyone can use the lift without charge – the same as in any other shopping mall in Hong Kong. In Hong Kong, part of the reason for the heavy reliance on migrant domestic workers is the extremely low provision of affordable child and elderly care. From the UK students, one of whom has a sister who runs a child care centre, we learned that the UK government offers working parents of children vouchers for 15 hours per week of childcare services from government subsidized childcare centres, and that this voucher allotment will be increased to 30 hours in 2017. This sounds like an admirable example for the Hong Kong government to follow; and it would surely reduce the need for Hong Kong to rely on such a low-wage and very restrictive (to workers) working conditions. However, the UK system still has problems; the child care centres have difficulty running profitably while providing child care and receiving the government subsidies which do not fully compensate for the operational costs. 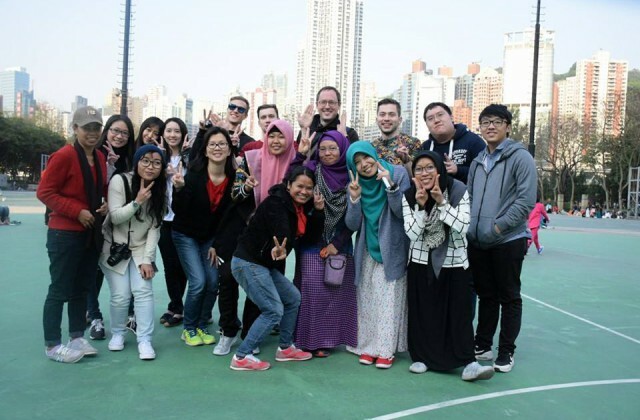 The same day as our walking tour, a film screening and press launch for a new movie “Justice for All”, about the abused Indonesian domestic worker Erwiana, was being held to a very packed crowd at City University of Hong Kong. Erwiana herself was present. Every day, more and more Hong Kong people are becoming awakened to the reality of domestic workers and the need to make sure our care needs are met in a fair and humane way. It is a small step forward that there is no more $5 lift. Let’s go further – end all the discrimination in the city!